Johnny and Janney Anderson sit surrounded by their children, Shawn Anderson and Sha’Lyn Moore, and their families. Bottom row, left to right: Rhett, Tate and Beau Anderson; Janney and Johnny Anderson; Jordan Moore. Top Row, left to right: Shawn and Heather Anderson; Sha’Lyn and Shane Moore. Considered a dynamic duo in the South Plains cotton industry, the Andersons have served the area’s producers and coop gins with an unmatched level of commitment. Since day one, their eyes have been set on the producers when they aren’t lovingly looking at each other. Both Johnny’s and Janney’s dedication to the industry remains constant and dependable even after 1.5 million miles of travel, years of service and countless memories made. Johnny was born into a cotton farming family and raised in O’Donnell, Texas. He is an alumnus of South Plains College in Levelland, Texas. Janney was born and raised in Lubbock, Texas, where her father worked in construction, and she attended Draughan’s Business College. The term “young love” is certainly applicable when describing how the couple met. Before their story began, Janney graduated from Lubbock High and Johnny graduated from O’Donnell ISD. While Janney was in college she met Johnny, who was working at Jim Taylor Motor Company, through a mutual friend. They fell in love in the spring, married in the fall, and moved to O’Donnell, Texas, the following January. Today, the couple has been married for 45 years and will celebrate their anniversary in September. 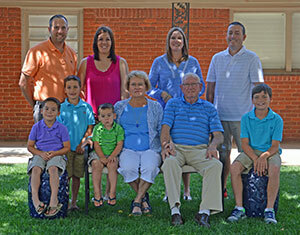 The Andersons have two children, Shawn Anderson and Sha’Lyn Moore, and four grandsons. Janney has worked both in and outside of agriculture. Prior to her current job at Slaton Coop Gin, she worked as a legal secretary in Tahoka, Texas, a city tax assessor and judge in O’Donnell, and later a part time bookkeeper at Farmer’s Coop Gin in O’Donnell. In 1983, she took a full time bookkeeping position at the same gin. Janney began working at the Slaton Coop Gin in 2003 and said she has enjoyed every minute of it. to work for the High Plains Boll Weevil Program. In 1986, Johnny accepted a field representative position at Plains Cotton Growers where he still works today. Speaking from their rich experiences, the Andersons said the cotton industry and its people create a working environment unlike any other. Whether it is the farmers supporting the Andersons, or the Andersons supporting the farmers in their respective areas of work, the agricultural industry is bettered because the duo’s job does not end when they go home for the day. They not only help those involved in agriculture, but are involved in the industry personally as well. Mary Jane Buerkle, PCG’s Director of Communications and Public Affairs, said the Andersons’ multi-faceted involvement in agriculture helps them relate to others on a deeper level than business. “They can really empathize with people and at the same time help them understand so many of the things we are dealing with,” she said. to those related to them in agriculture, the Andersons enjoy seeing others succeed and find great responsibility in serving them. Buerkle said the Andersons are well known for their continual hard work and big hearts; both of which make them a vital asset to the cotton industry and their respective employers. Johnny and Janney Anderson have built up a legacy that will last long after their time in the industry is through. Speaking on behalf of their future, they both see retirement, but more than that, a chance to travel, spend more time with family and friends, and lovingly gaze into each others eyes as they always have. Without a doubt, the Anderson’s love for each other has transformed into a love for the world of cotton and the people in its fields. Their unsurpassed dedication to the industry has written a story that will be shared by many for years to come.